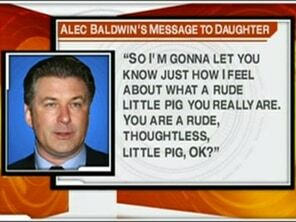 April 20: A phone message the actor Alec Baldwin left his daughter has been leaked online. TODAY's Natalie Morales reports. Alec Baldwin was so furious with his 11-year-old daughter Ireland that he left her an enraged voicemail message that is landing him in legal trouble. Ireland missed a scheduled phone call with her father, and the message Baldwin left was so alarming, a Los Angeles family court judge suspended all contact and visitation between father and daughter until further hearing on May 4. Baldwin and his ex-wife Kim Basinger have been in a long-running feud over custody and visitation since their divorce in 1992. The famous ex-couple’s feud is one of Hollywood’s most notorious and bitter battles. While Baldwin may have had a right to his feelings of anger, hurt and disappointment, he had no right to unleash his vitriolic tirade on their child. Divorced parents who battle over custody and visitation experience some of the worst feelings on the emotional spectrum. But it is how parents deal with their strong feelings that enable the children of divorced parents to lead normal lives and to develop into healthy, well-adjusted adults. In order for Baldwin to regain his visitation rights, he has to prove to the court that he has a plan to manage his anger and to learn to express his feelings appropriately. I expect the court to order the child into counseling, Baldwin into counseling, and order Baldwin and Ireland into counseling together. Clearly, their family dynamic is a damaged and dysfunctional one, but the court’s job is not to punish a troubled family but to encourage the parents and children to establish a plan toward healthier relationships. The court has to do what is in the best interests of the child, at all times. Clearly this child should have a relationship with both her mother and her father. If her mother is engaging in behavior that interferes with Baldwin’s access to his daughter, and is causing alienation of affection, the court must address her inappropriate behavior and make sure Baldwin’s contact with his daughter is not thwarted by a vengeful ex-spouse. Likewise, if Baldwin’s explosive temper and expression of emotion is damaging to the child, then Baldwin must demonstrate to the court that he is capable of expressing his feelings appropriately. He has to act like the adult at all times, not like an eleven year old. I expect the court to order everyone into counseling, and to order supervised visitation for a short period of time, to be monitored by the court, to make sure that both parents are able to have a healthy loving relationship with their child. And I expect the court to order an evaluation of Ireland, to make sure that she is not irreparably harmed by her parents’ battles. To have family problems as a young person is hard enough, but to have them so thoroughly aired in public must be absolutely humiliating. Death for killer of pregnant mom, children?